Kansas City University is committed to establishing a College of Dental Medicine on our Farber-McIntire Campus in Joplin Missouri. We will soon be completing our due diligence process and expect to be making a public announcement shortly. The hiring of Dr. Koelbl, a nationally recognized expert in dental education, is but one step towards the establishment of a world-class College of Dental Medicine that can serve our Four State Area. "Building on the osteopathic philosophy of ‘whole health,’ the addition of oral health education would help bridge the gap between medical and dental care, more fully integrate oral health into primary care, and expand access to preventive services for children and adults in the region"
James Koelbl, DDS, MS, MJ, has joined Kansas City University of Medicine and Biosciences (KCU) as vice provost for oral health initiatives. Koelbl will assist in KCU’s due diligence as it completes a feasibility study for establishing a College of Dental Medicine on the university’s Joplin, Missouri, campus. The proposed program will serve the “four-corners” region of southwest Missouri, northwest Arkansas, northeast Oklahoma and southeast Kansas. KCU began the study last year in response to the critical shortage of dental health providers in the region. The vast majority of counties within a 125-mile radius of Joplin are designated as a Dental Health Professional Shortage Area, according to research conducted in 2018 by strategic consulting services firm Tripp Umbach. Koelbl was recently honored by the American Dental Education Association (ADEA) with the 2019 Distinguished Service Award. This premier award recognizes an individual’s significant contributions to ADEA’s mission to lead and address issues influencing education, research and delivery of oral health care. At KCU, Koelbl will help assess faculty and patient needs, as well as lead the process to explore program accreditation. He will also lead outreach to the regional dental community and potential clinical partners. Koelbl has had a distinguished career with a wide range of expertise in the fields of oral health education and practice. 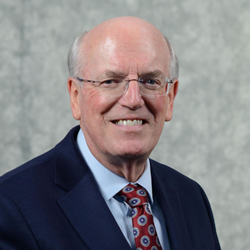 He previously served as founding dean for both the University of New England College of Dental Medicine in Portland, Maine, and Western University Health Sciences College of Dental Medicine in Pomona, California. He served as dean for West Virginia University School of Dentistry and has held administrative and faculty positions in dental education at six universities. Koelbl also served as an associate executive director of the American Dental Association with responsibilities for the divisions of dental education, dental practice and science. He has served as a site visit chair for the Commission on Dental Accreditation, later joining the Commission as a member and serving in the roles of vice-chair and chair. He practiced general dentistry for more than 20 years in rural and urban areas. Koelbl is a member of the American Dental Association and the Missouri Dental Association, and a fellow of the American College of Dentists and the International College of Dentists. Kansas City University of Medicine and Biosciences, founded in 1916, is a fully accredited, private health sciences university, with a College of Biosciences and a College of Osteopathic Medicine. The College of Osteopathic Medicine is the oldest medical school in Kansas City, Missouri, and the largest in the state. It is the second-leading provider of physicians within the states of Missouri and Kansas. KCU opened a second medical school campus in Joplin, Missouri in 2017 to help address the growing need for primary care physicians in the region’s rural communities.